If the Terminator storyline ever becomes reality, the birth of Skynet will probably start with small and simple robots made at home - such as ones that can break locks after just a few seconds of work. Hacker and software consultant Samy Kamkar has shown off just such a robot - which he's calling Combo Breaker - on his website. It's based around an Arduino board and uses some parts made in a 3D printer. 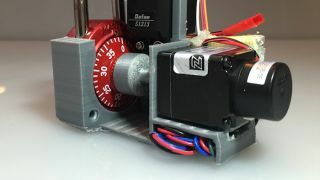 The Combo Breaker uses a vulnerability in Master Lock padlocks that Kamkar recently discovered himself: it essentially brute forces the lock in the same way a software bot could try millions of passwords to find the right one. The lock-picking trick actually relies on a manufacturing flaw in low-end Master Lock devices, where slight changes in resistance reveal the combination. Presumably it's a flaw that can be eradicated - so we're safe from the machines for now. Still, it's a reminder of how quickly both 3D-printing and robotics are progressing, and the various security concerns they raise as a result. Master Lock does rate its products in terms of their security protection, and the models involved only score a 3. "The moral is pretty simple," says Kamkar. "If you're trying to protect valuables in a storage locker, you should probably be using a better lock." By releasing details of the hack he hopes to get the general public thinking more about their own security - so consider yourselves warned.